Many people nowadays prefer to buy organic or natural materials-based bedding products, which have relatively low environmental footprints. Organic bedding contains only a few harmful chemical substances that are considered hazardous to humans. The shoppers of mattresses are no exception to this. Currently, the market for mattresses offers an extensive variety of organic choices for organic conscious shoppers. When you shop for the best natural mattress, it is of significant importance to look for organic certifications. Mattresses composed of natural or organic raw materials should have standard organic certifications, like the OEKO-TEX 100 Standard, and Global Organic Textile Standards etc. These certifications are evidence that these best natural mattresses have genuine natural materials with low impact on the environment. If you are an organic conscious shopper too, we have compiled a tried and tested list of 7 best organic mattresses. The unique feature of this best natural mattress is the two different firmness options packed in a single mattress. One side offers “medium soft” support while the other side provides “firm’ support. Its design is perfect for sleepers whose firmness choice is not clear or if the mattress is in a guest room used by many different people with different preferences. Zenhaven is an exclusive natural mattress by Saatva. It is a best natural latex mattress composed of natural 100% Talalay latex with an organic cotton cover. It offers dual firmness levels in a single mattress. Both the layers are made up of natural latex, which is an eco-friendly material. It conforms to the body contours and shapes and provides extra spinal support and alignment. Those who suffer from backache or other back problems can choose to sleep on the firmer side for better support. The latex and cotton also offer body temperature regulating qualities for cooler sleep. Other qualities of Zenhaven include effective motion isolation and suitability for all weights even for heavy or overweight people. It is one of the best affordable natural mattresses. Zenhaven latex mattress is available with a 120 nights free sleep trial and backed by a 20-year warranty period. The company provides white-glove delivery for US customers, including assembly and removal of the old mattress without extra cost. The highlighting feature of this mattress is its 3 customizable layers that offer different firmness levels. You can remove the layers as desired from the covering to achieve the desired level of firmness. Spindle mattress is a customizable latex mattress, which has three layers of natural Dunlop mattress. These three latex layers differ in density with a thickness of 3 inches each. The density of latex layers ranges from 4.6 PCF- 5.6 PCF, which depends on the extent of firmness chosen for the mattress. Its covering is composed of an organic cotton layer with a one-inch natural wool batting layer. This layer serves a dual purpose as a fire-resistant barrier and provides breathability. The design of the Spindle mattress is such that you can customize it to fit your sleeping needs. Each layer of latex can be removed and substituted with a layer of required firmness. This changes the firmness level of the whole mattress. It is an all foam mattress but does not give the traditional feel of a memory foam mattress. Despite its all-foam construction, it offers plenty of bounce yet medium firmness for required body support. The use of all latex makes it breathable, allowing easy airflow for a cool and comforting sleep. It comes with a 30-night free trial and a 25-year warranty. The highlighting quality of this natural mattress is its firm support and soft comfort design. 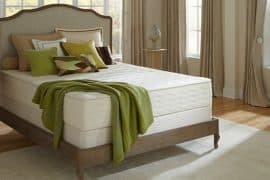 The firmness of natural latex relives pressure points in your body while keeping your back aligned for a more comfortable and pain-free sleep. It is also declared safe for babies under the age of one. 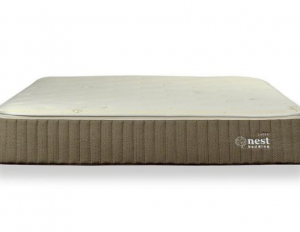 This eco-friendly mattress is a good overall choice for the best natural latex mattress. It gives you the best value for your investment with a lifetime warranty. 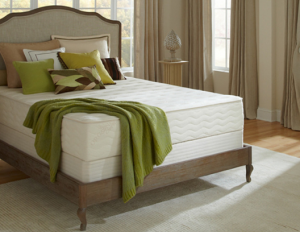 Made using 100% natural Talalay latex, Natures Novel mattress offers a perfect level of comfort and support. It is rated among the best latex mattresses for its natural qualities that refresh your body and mind. Latex provides your body with brilliant support. It keeps your back aligned to provide pain-free and comfortable sleep. Natures Novel mattress features 2 layers of latex, which are enveloped in a natural cotton and wool cover. 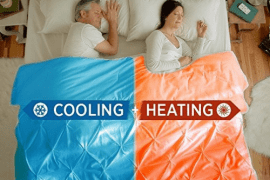 This makes the mattress highly breathable, providing temperature regulating qualities for cooler sleep. The 100% natural Talalay latex layer is followed by Eco latex support layer manufactured through the Dunlop process. Both these layers align your spine during all sleep positions, which relieves back pain. It gives your body firm support while promoting airflow for a dry and moisture-free sleep. 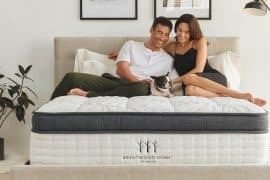 Another couple-friendly mattress on our list is Botanical Bliss 12-inch medium mattress Botanical Bliss is a good option for couples who want an organic mattress with little to no motion transfer. It provides the right support for romance to couples while in bed. This amazing mattress is composed of four layers of organic Dunlop latex. These layers are under the top organic cotton covering followed by organic wool from New Zealand. The organic cotton layer provides you with breathable comfort with unrestricted airflow. It absorbs your body’s moisture, keeping it cool, calm and dry. The layer of wool offers superb natural breathability. The latex layers are calibrated uniquely to adjust to different firmness levels. This enables you to adjust the softness and comfort level with desired support for the ultimate sleeping experience. It is resistant to motion transfer for a calming sleep. Botanical Bliss gently cradles your body and relieves pressure points. It helps relieve body aches and pains, promoting deep slumber. Botanical bliss is available with a 100-night free trial and 25-year warranty, which make it a safe investment. It is the softest choice among the 5 best natural mattresses enlisted here. 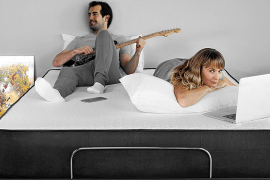 It offers customized split comfort for partners who like to sleep on different firmness levels. Combination of latex and spring coils provides outstanding bounce that is ideal for sexually active couples. If you are looking for a good latex mattress that is extra soft, then this is a good option. 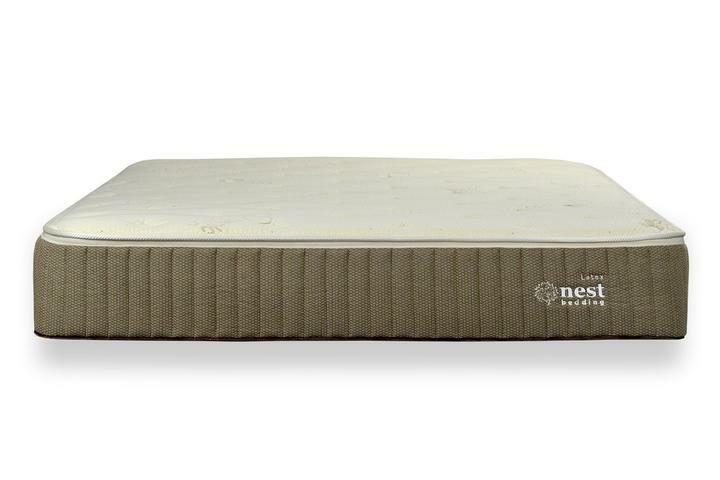 The Nest Latex mattress is considered one of the best latex mattresses, especially for couples. It offers a unique organic blend of organic latex with spring coils. It provides extra bounce with softness, temperature regulating and pressure-relieving qualities ideal for a plush and comfortable sleep. It can be custom made for either medium or firm firmness on both sides when you get a king. 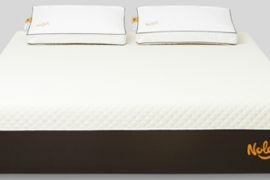 Its top layers are composed of a pure organic wool layer, organic cotton, and 2-inches of certified organic Talalay latex. This natural mattress has 8-inch quantum edge coils, which offer better edge support and is more reinforced in the middle. It is brilliant for couples who enjoy extra bounce with maximized space. The mattress is available with a 100-night free trial and a guarantee of lifetime comfort. Additionally, you can exchange the mattress to get a new one by paying 50% of the original retail price. What Makes A Mattress Green and Natural? Nowadays, people are getting aware of the health risks of harmful chemicals used in the manufacturing of mattresses. There is a large number of chemicals from blowing agents to foam adhesives, dyes, additives and many more. Although there is no specific definition of a green or eco-friendly mattress, generally it means a product that does not cause harm or minimizes harm to the environment as compared to alternative products. 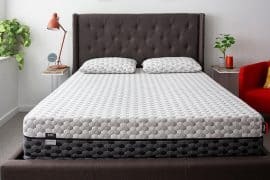 Presently, there is a certain eco-friendly selection of mattresses that you can find on the market which include 100% organic latex, natural cotton, organic wool, memory foam with plant-based and inner pocket springs. These products differ in their cost, durability, price, and warranty. The organic allied fabrics and materials used in these mattresses also have an effect on the overall function and quality of the mattresses. All natural latex is a popular material used in organic mattresses. It is taken from the Hevea brasiliensis tree which is minimally treated to produce the latex foam material used in making mattresses. The natural latex mattresses have become a favorite choice for lovers of eco-friendly mattresses. The manufacturers of all natural latex mattresses use renewable and green harvesting processes that have low-impact on the environment to ensure the lowest chemical impact. Latex is considered naturally resistant to various allergens, such as molds, dust mites and is much more resilient to polyurethane. The latex trees have a time span of 25 years or more during which they continue to grow and benefit the environment. With the passage of time, older trees transform to eco-friendly wooden products. All natural latex offers ultimate comfort with a soft and sinking feel which is followed instantly by bouncy natural support. It promotes relief from pain, which makes it a perfect choice for back and joint pain relief. It provides support for the natural alignment and curvature of the spine. The latex material is naturally resistant to molds, dust mites, and other allergens, which promotes healthy sleep. Due to the large-sized cells of latex, it promotes easy air flow and circulation which regulates body temperature during sleep. It is heavier in weight as compared to other types of foam mattresses. The weight depends on the presence of different materials as well as their density. The latex mattresses tend to have a higher cost than the regular memory foam or spring mattresses. Cotton has been one of the most commonly used materials in mattress manufacturing. Organic cotton is often used as filling or covering on mattresses nowadays. It is grown organically with minimal use of chemicals or pesticides. The cotton material is used in mattresses for its durability, breathability, and comfort. Most of the foam mattresses retain your body heat which gives you hot sensations during sleep. This causes your body temperature to rise during the night, causing tossing and turning. Many mattress manufacturers have created gel foams to provide a solution to this issue, but the simplest way is cotton. Cotton is highly breathable due to which it is widely used in bedding, clothing and mattress manufacturing. If you feel hot at night, it is best to use the mattress that utilizes cotton as filling or covering. Cotton is a natural material which is manufactured right here in our country. Natural material means hygienic and safe sleep without chemicals and without the use of petroleum-based substances. It keeps your body safe from allergens and regulates body temperature, facilitating a restful sleep. Cotton being durable gives maximum value on your purchase and increases the life expectancy of your mattress. The all natural and unbleached long cotton staples are the most longer-lasting materials that can be used to construct mattresses. Dust mites can affect the quality of natural cotton material which can be damaging to your sleep quality. So, it is not suitable if you suffer from allergic reactions. Organic natural wool is obtained from sheep fur. The wool is sheared from sheep many times during their lives. The most popular kind of wool is the New Zealand wool, which is used widely for its finest quality. It is plush, warm yet breathable. It is commonly used in the cover or in the comfort layer. When used in the comfort layer, it is tightly packed inside the mattress which adds extra softness to the top layer of a mattress. The wool used in natural mattresses is untreated and may have some natural smell of barnyard. It also acts as a natural fire-resistant material in the mattress. As it is produced and processed without the use of chemicals, it assures reduction of your carbon footprint on the environment. It is used in the comfort layers of mattresses to add extra softness and comfort. It is an eco-friendly choice for use in natural mattresses. It is a naturally breathable material which regulates body temperature during sleep. Wool is not suggested for people who suffer from allergies as wool is vulnerable to allergens. As compared to other natural materials, the durability of wool is comparatively less as it flattens with time. The effectiveness of wool in the mattress is completely dependent on the craftsmanship of the mattress. If the packing of wool is not good, it quickly sags and can encounter durability problems. 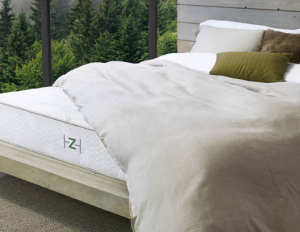 Plant-based foam and memory foam mattresses are manufactured predominantly from plant-based raw materials, including soy or oils derived from plants. The portion of petroleum-based raw materials used in traditional memory foam is replaced with plant-based oils, which give them organic qualities. The percentage of these materials used in the manufacturing of mattresses varies from company to company. So, you need to check the precise percentage before buying a plant-based memory foam mattress. Plant ingredient based memory foam mattresses are more breathable as they have widely open cell structure. This allows better breathability and keeps your body cool throughout the night, improving sleep quality. It is free from the unpleasant odors and presence of chemical substances. The response time of the plant-based foam/memory foam mattresses is the duration of time it takes to get back to its original form after you get up from it. These mattresses typically have 6-8 minutes of response time, which is not affected by body temperature. This means that these mattresses contour well to the shape of your body whether the temperature of the environment is hotter than the body temperature or not. The better response time facilitates ease of movement, offering better comfort. These mattresses come in different firmness levels and offer support to your body where it’s most required. The memory foam mattress has very little to no bounce due to which it is not considered conducive to sexual encounters or for people who constantly change position during sleep. When you shop for the best natural mattresses, you will find so many certifications listed on the labels that claim different things. This makes it really difficult to determine which mattress is partially or fully free of chemical substances. For instance, some natural mattresses claim to be ‘all natural’. But without certification listings on the label, this claim has no authenticity. In order for the mattress to be certified organic, it should be composed of up to 95% organic materials and any harmful chemicals should not be involved in its manufacturing. This is an independent global and consistent testing and certification system developed for all processing levels of raw materials, finished as well as semi-finished products. The purpose of this certification is to limit or completely exclude the use of harmful chemicals substances in the products and their manufacturing. The duration of certification for any product is one year after which the manufacturers need to update it. The OEKO-Tex Standard 100 testing system has been testing safety and effectiveness of products for the past many decades. It continues to make valuable contributions to ensure high standards of product safety for consumers. OEKO-TEX Standard100 comes in classes. What you need to be on the lookout for is class 1. Class one of OEKO-TEX Standard100 means that a product is safe for children under 3 years. This means the product is as safe as it can be. The best organic mattresses that carry Eco institute’s certification means that these are safe for use at home without the traces of harmful chemicals. These mattresses will not produce unpleasant and unhealthy off-gassing, which is harmful to health. The institute carries out tests on products to check the presence of various kinds of potentially harmful materials, including VOCs (volatile organic compounds), consistent natural pollutants, the presence of heavy metals, use of any pesticides and many others. This certification is provided by an independent certification organization without any vested interests in the certified products so you can rely on this certification while buying organic mattresses. GOTS is given to textile products that are manufactured from organically harvested and grown raw materials. It is awarded to textile products manufactured from organic fibers and processed without the use of harmful chemical substances. The aim of this certification is to define organic fiber global standards from the time of harvesting the raw materials to final labeling. It also considers environment-friendliness as well as socially responsible manufacturing processes. Their process gives credibility and assurance to consumers that the product is safe and healthy for use. While looking for an organic mattress, choose the mattress with GOTS certification that ensures that it is not just manufactured from organic raw material, but also through an organic manufacturing process. 95% of certified organic raw materials are used in manufacturing. The land has not been treated with pesticides or any harmful chemical fertilizers for the past 3-4 years. Regular testing of soil has been carried out with daily testing of water samples. The manufacturing place should have placed a written policy for the management of waste materials or pollutants generated during the manufacturing process. The strict policies have been followed regarding the labor wages, hours of work and child labor etc. The organic latex has been stored separately from regular or chemically processed latex. Look for this certification on the best natural mattresses, if you are concerned about the negative health effects of VOCs, adhesives and other chemicals used in manufacturing. The Green Guard testing system tests products for any chemical emissions (specifically for chemicals that turn to gas at normal room temperature). It does not test any types of heavy metals, PVC and phthalates in the products. A mattress that has a Green Guard certification means that no harmful VOCs were found during the emission testing process. It does not certify that the product does not contain any toxic or harmful chemical substances in the mattress. The organic program is a certification that is given to products that are produced through USDA’s Organic program approved methodologies. It defines the specific standards that must be followed to verify the product as a USDA accredited organic product. These standards cover the entire process from harvesting to growth of raw materials, their handling, and processing. 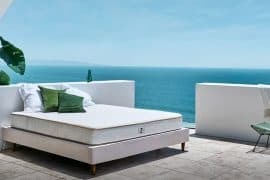 It also includes the protection of natural resources, conservation of biodiversity and the utilization of only approved organic substances in the manufacturing of mattresses. When you see a USDA Organic program certification on the mattress it means the manufacturer has followed organic, environmentally and socially responsible practices from start to finish. The Cradle to Cradle certification guides manufacturers to check products for the 5 quality categories, which include the health of materials, reutilization of materials, renewable energy and management of carbon, water stewardship along with social fairness. There are five achievement levels assigned to each product category; Basic, Bronze, Silver, Gold, and Platinum. These achievement levels mark the overall quality of the product. Professional experts from the organization review and test products in these five quality categories. Accreditation is provided to products that fulfill Cradle to Cradle Certification criteria. The manufacturers are required to submit their products for review every 2 years for recertification. GRS is international level voluntary and full product standardization. It puts forth the requirements for certification of third-party recycled materials, chain of custody, environmental and social practices followed and chemicals restrictions. It is meant for companies that search for the verification of recycled materials in their products including intermediate and finished, social and environmental responsibility and chemical practices followed in their manufacturing. The major objective of GRS is to explain the requirements to ensure precise and reliable material claims with good working conditions. It also ensures that the harmful impacts of chemical substances are minimized on the environment. It is developed by Global foam industry members; so, it cannot be rated as an independent certification or third-party eco-certification. The focus of CertiPUR-US is purely on ensuring the quality and safety of polyurethane foam. It is a voluntary standard developed to assure the polyurethane foam’s health and safety as well as environmental performance exclusively used in bedding textiles and upholstery furniture. CertiPUR-US puts a restriction on the emission values and testing of content which makes it nearly similar to OEKO-Tex standards. It tests the foam for harmful chemical emissions, material content and its durability. Its testing parameters include VOCs, ozone depleters, any kind of toxic metals, phthalates, methylene chloride, PBDEs and formaldehyde. What Are the Advantages of a Natural Mattress? The best natural mattresses are great for your health. They offer multiple health benefits which are not possible with synthetic foam mattresses. Most organic mattresses are primarily composed of organic materials, such as latex which is not harmful to your health. Harvested and growing organic crops, chemicals and pesticides are not incorporated in the manufacturing of traditional foam mattresses. These mattresses are hypoallergenic, which means they are resistant to mildew, molds and dust mites. This makes them perfect for people suffering from different allergies. These mattresses give you a comfortable night free of sneezing, coughing, and flu. There are little or no harmful chemicals used in the processing of organic mattresses. The organic mattresses do not contain any metals, which are used in dyes and making of conventional foam mattresses. There is no worry of hazardous off-gassing and they are naturally fire resistant due to use of natural wool. Many natural mattresses are known for their superior comfort and support. These mattresses, especially latex ones, have an innate body support system because it aligns and conforms to your body’s shape and reduces pressure points. These mattresses evenly distribute your body weight while facilitating even circulation of blood for sound sleep. There are plenty of air spaces between the cells of organic materials such as wool, cotton, and latex which allows for easy airflow. This wicks away moisture from your skin during the night and gives you a cool and comfortable sleep. These organic materials also provide a cushioning effect with a soft and bouncy yet firm feel. The organic latex is highly elastic which prevents it from getting compressed, unlike other traditional memory foam mattresses. It molds to the body shape which enables isolate motion and prevents sleep disturbances to your partner during sleep. Additionally, organic wool fibers are durable and elastic which prevents them from compressing. The Best organic mattresses generally come with a lifetime warranty. It is because the organic materials are highly durable and do not easily break down. The best natural latex mattresses are composed of organic textiles, which are highly durable, flexible and longer-lasting. Organic natural wool has an inherent crimp in its molecules which enables it to get back to its genuine shape after being compressed. It is possible to stretch the wool up to 50% when it is wet and 30% when it is dry. This flexibility in wool fibers makes them much more durable and extremely resistant to tearing. It can bounce back easily to its original shape when pressure is released. The wool fibers can be bent above 20,000 times without breakage. Just like wool, natural cotton is also known for its high durability. Think about your amazing cotton clothing that you have worn multiple times and it still retains its shape and texture and your cotton quilts that lasts for a lifetime. When you purchase a natural organic mattress, you contribute to reducing the carbon footprint on the environment while saving the ecosystem. Organic latex mattresses are sustainable as well as biodegradable. These mattresses are generally composed of all natural materials (organic wool, natural cotton, and organic latex) which are renewable materials and have a low impact on our environment. These materials are harvested and grown using natural fertilizers without toxic chemicals and pesticides and help build agricultural and biological diversity. Therefore, the organic harvesting techniques not just maintain the health of the soil, but also utilize fewer resources and have less impact on the planet. Latex is extracted through sustainable methods without causing damage to latex trees. It is all natural as well as a biodegradable material. Organic natural cotton is grown with less impact and sustainable methods which are not harmful to the environment. Wool is also a biodegradable and sustainable material sheared from free-grazing and ethically raised sheep. What Are The Disadvantages of a Natural Mattress? Although organic mattresses are better for health and have a low environmental impact, these are somewhat expensive as compared to traditional foam mattresses. You can get the regular synthetic foam mattress at half the price of the natural organic mattress. But this higher cost is really worth the price. It is because natural mattresses are highly durable. This cost is justified by the reduction in the frequency of replacing old synthetic mattresses. Another important factor that raises the cost of natural mattresses is extremely improved performance. Most natural mattresses provide enhanced comfort, healthier support to the body and a much more healthy way to sleep as compared to conventional mattresses. 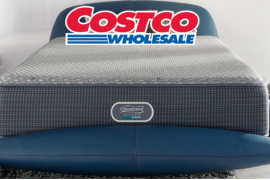 Additionally, the high-end coil spring mattresses may cost much more than organic latex mattresses while not offering similar comfort, support, and overall performance. So if you have a limited budget you may not be able to buy an organic mattress, but spending some extra bucks will really be worth it. You may not find organic natural mattresses in regular shops. Also, there are very few mattress brands which sell organic mattresses. It is because these mattresses are costly to manufacture due to the use of organic raw materials. The processing cost is higher. The duration to make a mattress is also longer as compared to most conventional mattresses. Due to the overall higher cost of production, the prices of natural mattresses are comparatively higher. Most of the natural mattress manufacturing companies custom manufacture these mattresses, which is a time taking process. Due to this factor, the customer base for organic mattresses is relatively low. Many people cannot afford to buy natural organic mattresses. Most of the natural mattresses are available online, but finding the right mattress can be a difficult task. The limited availability of these mattresses makes it difficult for buyers to find as well as purchase them. Hence, we created this list of best natural mattresses for your convenience. A natural latex mattress on average tends to be heavier as compared to a conventional memory foam mattress. It is because natural latex becomes dense when it is compressed to give a form, which adds weight. However, the weight of all natural mattresses differs greatly depending on the kind of materials used in manufacturing and their density. For instance, most natural latex mattresses are available in varying density and weight, depending on your requirements and sleeping preferences. Due to the heavier weight of natural latex mattresses, these require more effort and help to lift and move from one place to another. However, this disadvantage is not that serious because you do not need to move the mattress frequently. Once it’s placed on your bed, you may require moving it once or twice a year, which you can do with some help. What is the Best Natural, Eco-friendly and Organic Mattress? Organic natural mattresses made of natural raw materials have become increasingly popular in recent years. It is primarily because people are again seeking a clean, hygienic and healthy lifestyle. Your mattress is the place where you spend nearly half your life sleeping. So, it should provide you with hygienic sleep in addition to comfort. 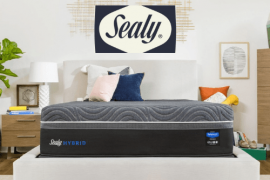 You may find a variety of mattress brands offering the best natural mattresses online, but finding the right eco-friendly, natural and organic mattress can be a difficult task. 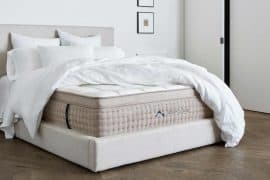 To help you choose the best organic mattress for you, here is a breakdown of some important elements to look for in your mattress. The top cover of the mattress has significant importance as it is the first layer your body comes in contact with. When you are looking for the best natural mattress for your sleeping needs, look for a mattress with natural Cotton, Tencel, and Wool covering. These are all organic, non-toxic and sustainable materials grown without the use of pesticide and harmful chemicals. The chemical-free covering of your mattress is made without the use of harmful dyes and chemicals. This prevents any harmful impacts on your health. Additionally, natural cotton and wool fabrics are highly durable, breathable and super soft.When you lie on your mattress your body heat is transferred to the mattress. In case of synthetic covering in conventional mattresses, your body temperature is not regulated. Instead, your body starts feeling hot and sweaty. On the other hand, natural cotton, wool or Tencel covering in organic mattresses is breathable and allows easy air flow. This helps regulate your body temperature as well as absorb any moisture or sweat, keeping your body cool and calm. This facilitates comfortable, cool and refreshing sleep. It is especially important for sleepers who experience hot flashes during sleep. Organic cotton or wool covering regulate their body temperature for a restful sleep. Next to the covering of the mattress is the comfort layer. After the organic covering, this layer also has significant importance in providing comfort to your body. This layer is a few inches in thickness and is responsible for providing support to the body. So when you search for the best natural mattress look for natural latex, natural plant-based memory foam or cotton fill comfort layers. The comfort layer of organic mattresses is important because it cradles the body while evenly distributing the weight of the body and provides pressure relief. It helps in instant response to motion during changing sleep positions and provides continuous comfort in every position. It also provides support to heavier body parts from sinking deeper into the organic mattress. Due to these qualities, the spine and body align perfectly for better and healthy sleep. 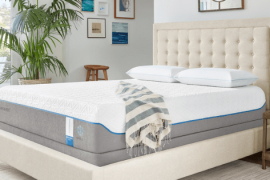 The use of natural latex and natural plant-based memory foam for the support layer provides comfort, support, and softness. All these materials, when used in the comfort layer, cradle your body and provide effective support, which conforms to the shape of your body. All the mattresses mentioned in the list of best natural mattresses have an organic comfort layer to provide a suitable level of comfort and support to your body. Most traditional foam mattresses use hazardous fire retardant materials mostly as filling for the mattress. In the traditional memory foam or synthetic foam mattresses, the primary material used for filling is polyurethane foam. It is a highly flammable and petroleum-based substance. Due to its high-flammability and use of toxic chemicals, it can be hazardous to your health. Look for a natural wool material as a fire retardant. It serves as a natural fire barrier. Organic wool has a high content of keratin protein and moisture, which make it naturally resistant to fire. It is one of the safest fire-resistant materials used in organic bedding. It allows natural mattresses to easily pass flammability tests without the use of chemical fire retardants. The use of the right proportion of natural wool develops a micro-climate which helps regulate the humidity and temperature of the body. This is an additional benefit that it provides. Natural silica is another good fire retardant material that can be used in organic mattresses, but wool is better in providing fire resistance and safety. The best natural mattresses mentioned in our list have wool as their fire-resistant barrier. When you are looking for the best natural organic mattress you may find big claims made by most organic mattress manufacturing companies. Ensure that these claims are backed by organic standard certifications. These certifications are given to mattress manufacturing companies at different manufacturing stages. These may focus on the risks to human health and/or impacts on the environment or both. There are various organic certifications given to natural mattresses which fulfill their standards. However, few manufacturers may make misleading claims without these certifications. Therefore, it is very important that you check their labels and websites for these green certifications. Some of the most common and important green certifications that are awarded to eco-friendly mattresses include OEKO-TEX, CentiPUR-US, and Eco-institute; they mainly focus on the risk factors related to human health. GOTS, GOLS, Green Guard and Green Guard Gold, USDA, Cradle to Cradle and the Global Recycled Standard mainly focuses on the environmental impact. When you buy an organic mattress, look for any one or a combination of these green certifications on the label. A natural mattress having one or more of these green certifications means that it is natural, good for health and has a low environmental impact. The best organic mattresses mentioned in the above list have the certifications from most of the eco-friendly standards. Our list of best natural mattresses will surely help you choose the perfect mattress that fits your sleeping requirements. Organic natural mattresses are great for your health, provide ample support to the body and back, regulate body temperature and come with a life-long guarantee. These mattresses conform to your body shape and provide pressure point relief to heavier body parts. 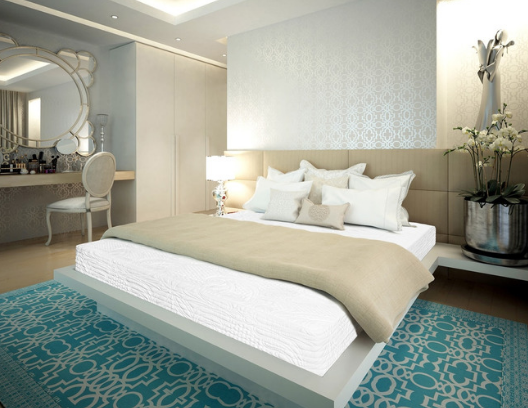 While choosing the best organic latex mattress, there are certain factors which you should consider including the covering, materials used in the cover and comfort layer as well as fire retardant filling. All these should be organic and natural to prevent hazardous health risks and harmful environmental impacts. There are some important organic bedding certifications awarded to organic mattresses including OEKO-TEX Standard 100, Eco-Institute, GOLS, GOTS and others. When you decide to buy an organic mattress, always look for these certifications on the label and their website to verify their claims. When shopping for the best affordable natural mattress makes sure you search and read the information about the things you don’t understand. It is worth making an investment in an all organic natural mattress if you choose the right mattress that fits your sleeping requirements and preferences.